Learn about the temperament and personality of the Harrier. Discover what he's like to live with, his traits and characteristics and how he generally behaves. And look at lots of Harrier photos. The Harrier is an intelligent, friendly, outgoing, happy, and loving breed. They love to have a job and will work tirelessly at it. They need daily exercise, but must be kept on a leash or in a securely fenced-in area. They have been known to dig under fences. Some Harriers really like to dig, especially if bored. These dogs are problem solvers. If they find a scent that interests them, they will follow it, nose to the ground, ignoring you no matter how earnestly you plead them to come back. The hunting instinct still runs strong in their blood. They enjoy hiking, biking, jogging, and some enjoy swimming. 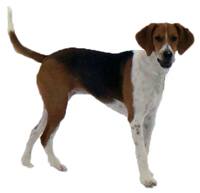 This breed excels at tracking and agility competitions. Harriers are smart and easy to train. They are also people-oriented. They are loving and affectionate. They want to be near their families and do not do well if left alone for hours at a time. If they get lonely, they will get destructive. They will want to play games with you, sit in your lap while you watch television, and sleep with you in your bed. They will never turn down a good tummy rub. If you leave the house for five minutes, expect your Harrier to be overjoyed upon your return. They are great with kids. They remain playful throughout their lives. They seem to have no dignity and will do just about anything to make you laugh. They can be talkative and have a distinctive and memorable singing voice. They have a varied repertoire of sounds, which includes moans, groans, and sighs. They also get along well with other animals. The Harrier is adaptable to many situations and makes a great family pet for an active family who is committed to his happiness. The Harrier is moderately easy to train. He learns new commands at the average rate. He is neither difficult nor easy to train. The Harrier sheds a fair amount of hair. You'll find hair stuck to your couch, carpets, clothes and everything else in your home.